In a split bill between Olivier Wevers’ Whim W’Him and Ballet Bellevue, this weekend’s lineup of Les Sylphides and Firebird at the Meydenbauer Theatre provided an exciting juxtaposition of of works that aimed to modernize classical ballets. The two companies took on the arduous (and often formidable) challenge of re-inventing timeless compositions in a way that remained both fresh and relatable. Wevers completely transformed Les Sylphides, an originally plot-less classical ballet, by reinvigorating the movement with narrative theatricality. Jennifer Porter’s Firebird had similar inspiration but took an already-narrative work and modernized its setting. Though Whim W’Him was more successful at refashioning Les Sylphides, the whole production was well worth seeing, even if only as an illustration of the commendable challenge of restaging established works. In classic Olivier Wevers style, this adaptation of Les Sylphides was magically risky, an almost unrecognizable take on the original choreographic score—so much so that it classifies more as a creative interpretation of the musical score rather than a restaging. Using a table as a prop, Wevers re-choreographed the piece as a dinner party attended by a manically unpredictable group of guests. The work began with one notable duo that argued perpetually, the dominant woman reprimanding her male partner in a verbal assault of gestural mime. Meanwhile, her sexual transgressions with another man were humorously un-secretive, shifting the tale with compositional ease. The work didn’t truly pick up steam, however, until the entrance of dancer Justin Reiter, who stole the show with his exaggeratedly dramatic movement, facial expressivity, and flamboyant outbursts that accompanied the sheer virtuosity of his dancing. All of the dancers were extraordinary in their dynamism as they carved hectically through space. Whether executing technical phrase work or staggering with almost drunken disorder, their characters appeared either frantically eager or agitated by boredom. The result was an air of manic instability. The manipulation of the table contributed to the frenetic shifts of energy; however, the table’s primary role was as a constantly changing set that established an illusion of spatial depth and architectural arrangement amidst the narrative’s organized chaos. With astounding visionary power, Les Sylphides was an eccentric tale executed with equally dynamic technique and personality – an ingenious reinvention that was well worth the risk. Ballet Bellevue’s Firebird was a similarly creative step towards modernizing a work of tradition. Morphing the original story from mythic forest to city street, Porter’s conception of Firebird aimed to transform the work into a more socially relevant one while maintaining the clarity of the storyline and technicality of the movement. The original Firebird was steeped in folklore, but Porter transformed the characters with the new setting: princesses became “ladies of questionable morals” and the magician became their “evil boss” whose command over the urban domain was cause for conflict. While the beautiful opening scene successfully depicted the anonymity and brisk culture of city life, the production as a whole struggled to convey a plot that was both clear and accessible to contemporary audiences. In addition to the difficulty of the task of modernizing an established work, this production was not entirely successful in its new characterizations. Although the program carefully dictated choices in the narrative, the character dynamics came across differently than perhaps was intended. For example, the women were startlingly reminiscent of prostitutes under the control of a formidable procurer and therefore did not read as subtly as planned. Fortunately, choreographically uplifting movement phrases that integrated allegro sequences and gestural expressions were both well incorporated and spatially aware. The Firebird flitted through space with frequent extensions and leaps while the corps members were staged on readable diagonals or in staggered formations, usually using gesture to accentuate the narrative. 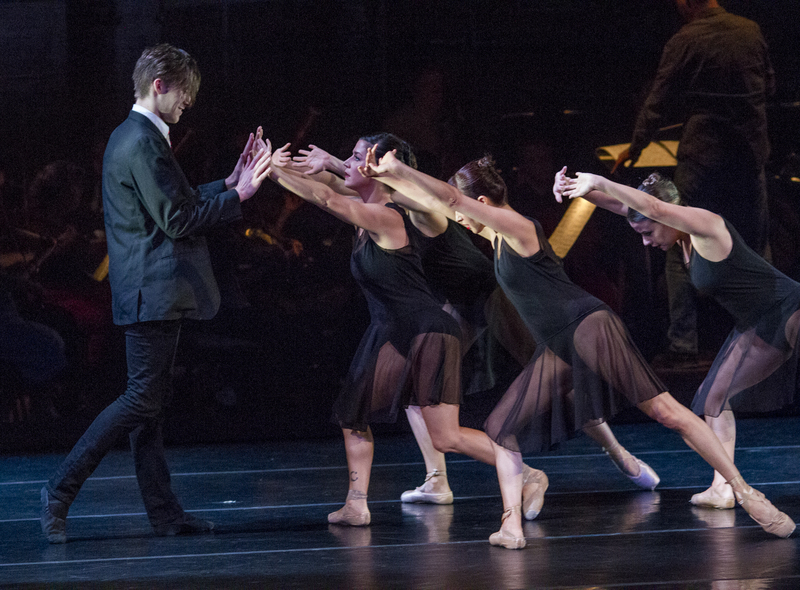 The decision to stage the orchestra behind the dancers was successful as well, and evocative of twenty-first century New York in a way that was both unexpected and exciting. Although some dancers appeared under-rehearsed and occasionally out of character, overall, Firebird provided a new lens through which to view an otherwise traditional ballet. Needless to say, to reinvent publicly recognized works is a gutsy and difficult feat, requiring an immense amount of imaginative capacity and choreographic ingenuity. Although Whim W’Him’s Les Sylphides may have been more relatable in this weekend’s production, Ballet Bellevue’s revamp of Firebird still goes appreciated as a preliminary step towards a more fully developed prospect for the future. After all, there is nothing more exciting about the creative process than taking risks, nor is there anything more exciting than watching those risks play out on stage. More information about Whim W’Him available here, and more information about Ballet Bellevue available here.